Women’s tennis: The women’s tennis team won its sixth NEC Championship title in the past eight years after defeating Fairleigh Dickinson 4-3. Senior Lisanne Steinert clinched the title for the Bobcats with a three-set victory in the No. 5 singles match. “It’s just amazing when you realize you won, all the teammates just come over. It just symbolizes that it’s a team effort to win this championship,” Steinert said. Freshman Juliet Labarthe was also an integral part of the team’s success, earning All-NEC First Team and Rookie of the Year honors. Lavinia Cristescu and Sarah Viebrock were also named All-NEC First Team, while Adrienne Markison was voted by her teammates as the team MVP. Head coach Mike Quitko was named NEC Coach of the Year after winning his 10th career NEC tournament between both the men and women. Men’s lacrosse: The men’s lacrosse team won a share of the NEC regular season title this season with Mount St. Mary’s and still has a chance to become the third spring team to win the championship. 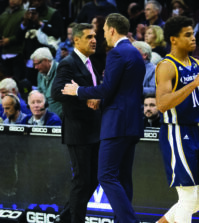 Behind the senior leadership of Kevin Kelly, Jack Oppenheimer, Kevin Benzing, and newcomers like Dylan Webster, the Bobcats have earned a No. 2 seed in the NEC Tournament. Kelly had a team high 35 points, with 21 goals and 14 assists while Oppenheimer became the ninth QU player to reach 100 career points. The Bobcats’ quest for the NEC begins Friday in a matchup against Robert Morris. 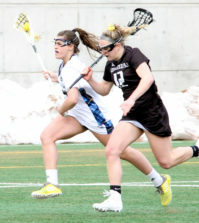 Women’s lacrosse: The women’s lacrosse team completed a historic season by winning the NEC Championship title after falling in the championship bout in the last three years to Sacred Heart. Junior Marissa Caroleo had a team-high 58 goals this season and Devon Gibney earned the tournament MVP and had six goals and one assist in the 15-3 victory over Mount St. Mary’s in the championship game. The team also achieved a program-record 13 wins this season.